Is it a Café Bar? A Bistro or Restaurant? Patisserie? 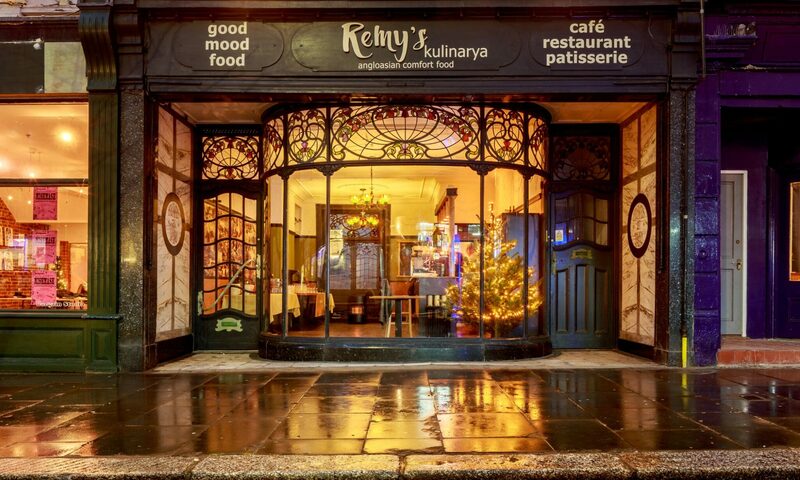 The answer is YES – in the City we would be a Fusion Café, and Remy’s Kulinarya is certainly where EAST meets WEST… We offer traditional English and Filipino food in a comfortable and attractive setting. Home cooked food at affordable prices. Philippines), Iced coffee and milk shakes. Continental quality at continental prices. A great choice daily with up to 3 different dishes to choose from, including vegetarian. Ranging from Filipino Kaldereta (Red wine marinated slow cooked beef with vegetables cooked in a spicy Filipino sauce & served with Jasmine Rice) or beef and vegetable noodle soup, to hearty ham and fried egg w/ bubble & squeak. Our Kitchen is entirely given over to a choice of over 20 freshly prepared homemade dishes including Paella, sumptuous bread crumbed King Prawns and Filipino Siomai. Our new evening menu ranges from favourite Filipino dishes such as Lechon Kawali; seasoned and roasted crispy pork belly with salad and sweet potato fries, to delicious homemade vegetable Paella topped with hot smoked salmon flakes. Specials often include Asian style steamed locally sourced fresh fish fillets cooked with soy, ginger, spring onion & samphire served with oriental vegetables and Jasmine rice. Prices start from under £10.00 for a main meal. Choose from Beef, Lamb, Chicken, Pork with crackling or Nut Roast* Our Top Quality Sunday Lunches are served with Roast Maris Piper potatoes and parsnips cooked in Beef dripping, fresh seasonal vegetables and Yorkshire pudding, with really tasty gravy. *Vegetarian options always available. Licensed from Midday until 11pm for the provision of Alcohol, and we offer a popular range of wine, spirits, and refreshing imported Filipino beers to accompany your food. Have a drink, snack or dine Al Fresco in the sunshine under the shelter of our beautiful awning and watch the Kings Road world go by…. Vegan Carob Cake @ Remy’s 👌👍 Alternative to Chocolate Cake for Vegans !! Gluten Free Carrot Cake !! Yummy! !